Similar to Enzo Ferrari, Sydney Allard also made fine road cars to finance his race car programme. Customers related to this and bought his powerful low volume road cars, buying into something of a rare and therefore prestigious brand of the time. Of lighter weight and by this time with independent front suspension, Sydney Allard had already been successful in pre-war car trials, races, speed trials, sprints and hill climbs. By 1953 Allard had also established that his cars had ample performance by finishing in long distance races, with a 3rd place at Le Mans in 1950 with his J2 Allard with 5.4 litre Cadillac V8, ahead of Tony Rolt and Duncan Hamilton. In 1952 Sydney Allard completed the picture by winning the Monte Carlo Rally in his Allard P1, this time powered by a 4,375 c.c. Ford V8 side-valve, just ahead of Sir Stirling Moss no less. The Allard P2 'Monte Carlo' two-door four-seater saloon followed the P1 in celebration of their Monte Carlo win. 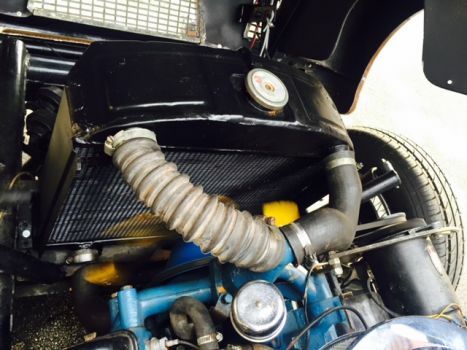 Fitted with a choice of Ford, V8 Cadillac or Chrysler engines, performance could now be considerably enhanced over the side-valve Ford engined P1. Sharing the same 9'4" wheelbase, the Allard P2 Safari Estate had the same narrow grill, designed to prevent Monte Carlo Rally snow from blocking the radiator intake, and was equipped with de Dion rear suspension and coil-sprung divided front axle. This suspension was developed on the J2 sports-racer, giving the P2 and the Safari estate car superb roadholding for such a large car. Estimates are that 10 Safari Allards were built, of which just 4 survive worldwide today. This important right-hand drive car was shipped new to the USA in 1953 without engine, a Cadillac V8 being fitted after its arrival. Ordered by Denver Imported Motors Inc of Colorado, it was first owned by a Mrs Caroline L Paquin Madison, also of Denver. In the early 1960s this Safari was sold to Richard H Zacks Automobiles of Distinction in Erie, Pennsylvania. He kept it until late 1978 when Zacks sold the car via the haulage company Martin Johnson, of Johnson Wild & Co, Newton-le-Willows, Lancashire, returning it to the UK in January 1979 to the last owner, a long term owner of a number of Allards from at least 1950 to 2008, Lt Colonel Rupert De Larrinaga of the Isle of Man. 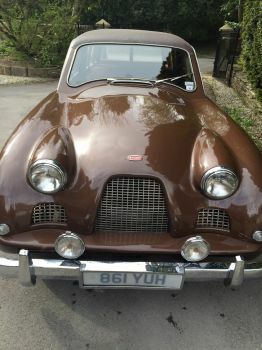 Understandably he became a personal friend of Sydney Allard, as a dedicated Allard owner for nigh on 60 years, driving Allards competitively and often changing his Allard for another. He served as an Army officer in occupied Germany, and later commanded The King's Regiment. In 1950 he purchased his potent Mercury-engined J2 Allard, then competed in the 1952 Oslo Winter Olympic games, captained the 1956 British Winter Olympic Ski team, directed the family's notable Larrinaga Steamship Company, and in 1994 appeared on Isle of Man stamps in celebration of 100 years of the International Olympic Committee. Sydney piloted Rupert De Larrinaga's fantastic Cadillac-powered JR Le Mans Roadster Allard chassis 3407 at Prescott on July 1955, coming 3rd in class. Over the course of the period from January 1979 until 2008 (when this car was acquired by the current enthusiast-owner) De Larrinaga treated this car to an extensive refurbishment by recognised specialists, including an engine rebuild by Vic Cartmell, of Tarleton, Lancashire, with restoration of the chassis and bodywork by Peter Wilford, of Hilldale, Lancashire. 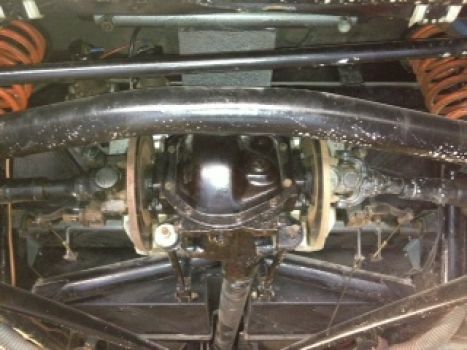 A new exhaust system was fitted, and a new clutch and a Chevrolet manual gearbox at this point were fitted, (the much-preferred 4-speed automatic transmission now fitted). The old de Dion rear axle was changed to use Jaguar E-Type Series 2 de Dion axle components with modified hubs, centre-lock wire wheels and superior in-board disc brakes. 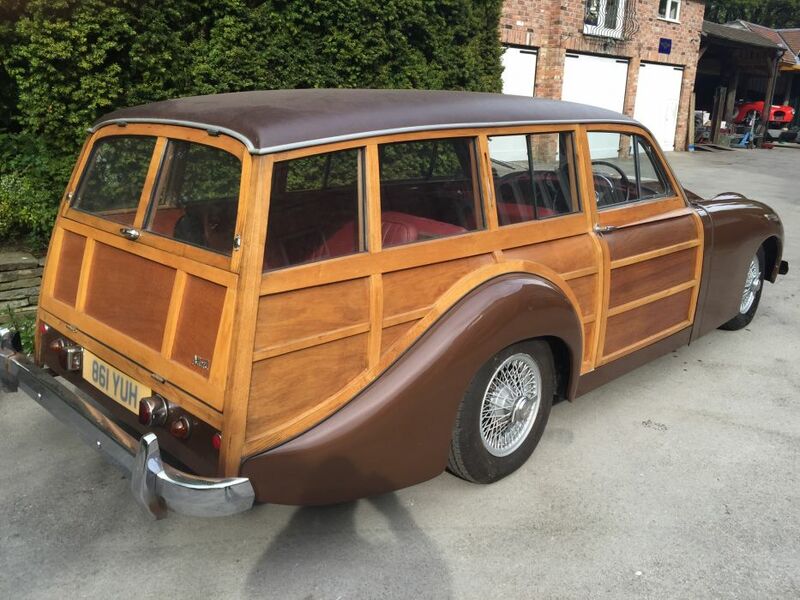 Many sections of the timber frame to the bodywork were replaced, together with new interior panelling, new headlining and re-upholstered rear seats. 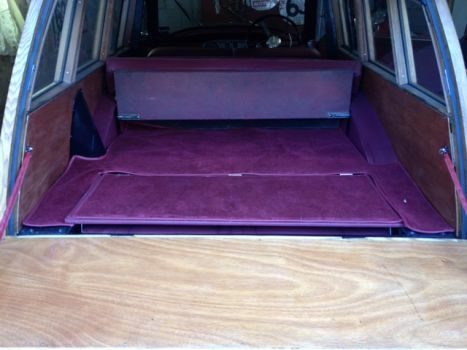 Structural work included new sills, floors and rear inner wheel arches, while repair work was carried out on the bonnet and rear wings. 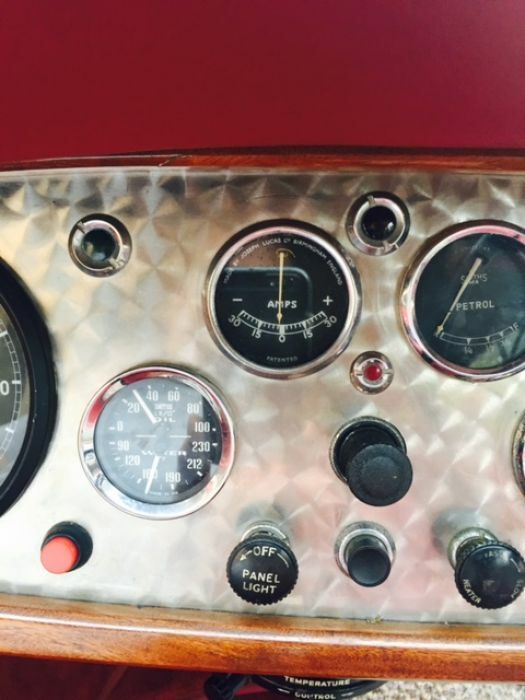 A new instrument panel was made for the original instruments and the whole car was re-wired. Other tasks completed during this time included fitting a valuable new windscreen & side windows, and a re-cored radiator. At this point this car was declared as still unfinished, and sold to the current owner in 2008. 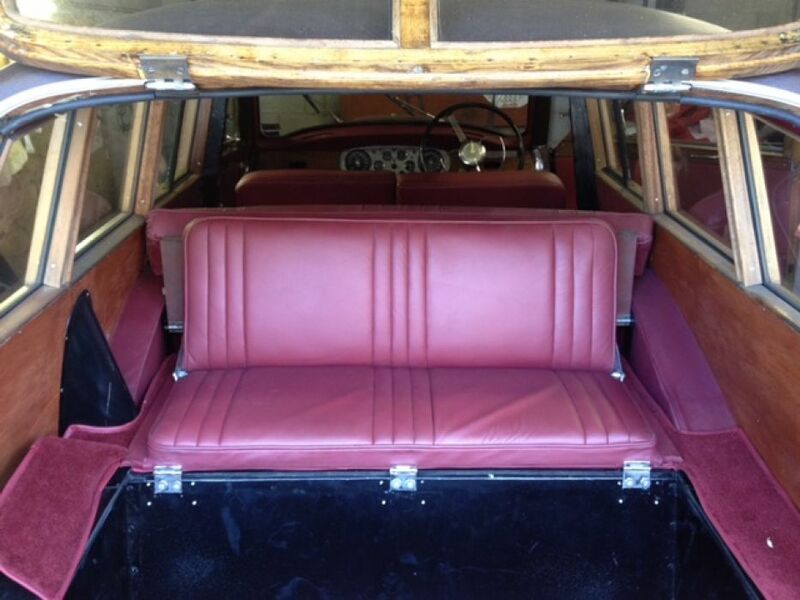 Recently completed, subsequent work from 2008 has transformed the car to as-good a condition as could be expected today. 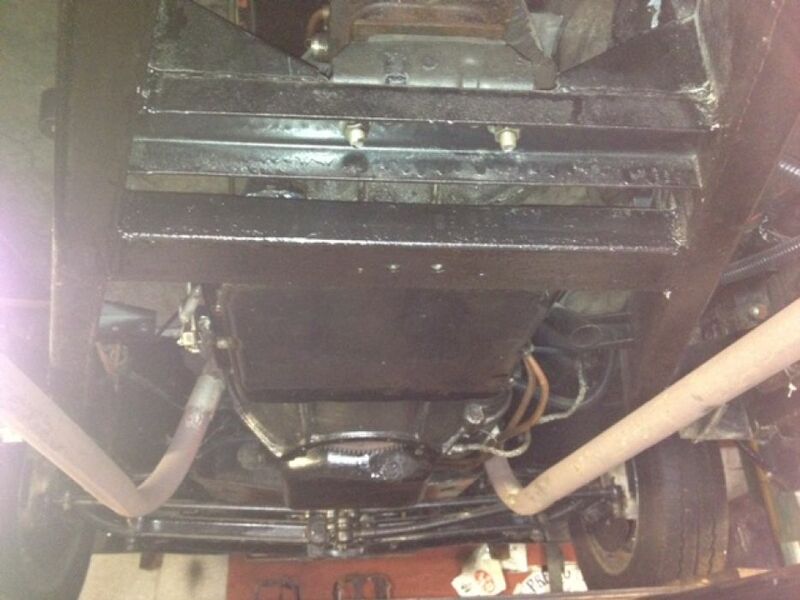 The body was removed and the chassis completely repainted. The tailgate was missing and a new one was made. 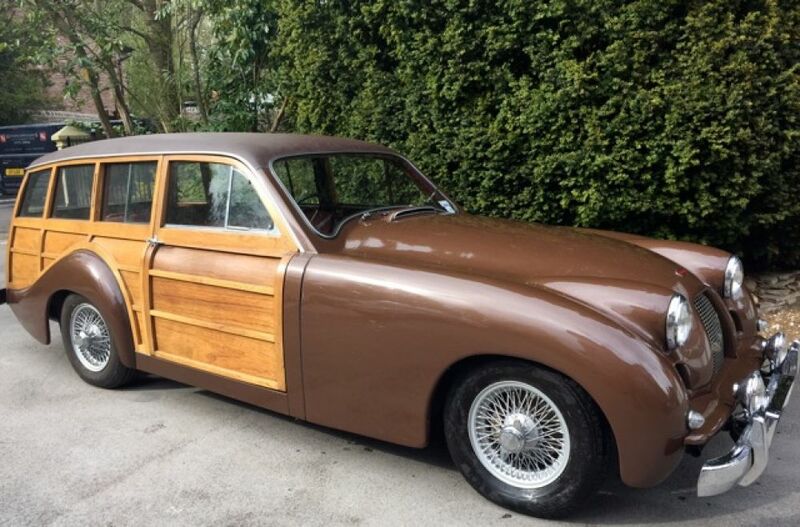 All the Safari's woodie woodwork was prepared to the same standard as a top quality varnished yacht with seven coats of varnish applied, properly flatted between coats. The previously repaired bonnet was removed again for the frame to be repaired and then powder coated. Back to bare metal, the body was primed and repainted to the correct shade of metallic bronze. A fresh pair of spotlights are fitted and the trafficators only need basic wiring. A set of new wire wheels and tyres complete the considerable visual appeal of this restored Allard Safari. A rebuilt 5.4 litre V8 Cadillac engine was shipped over and fitted to an appropriate General Motors 4-speed automatic transmission, the same as fitted to the Rolls-Royce Silver Wraith and Bentley R type. 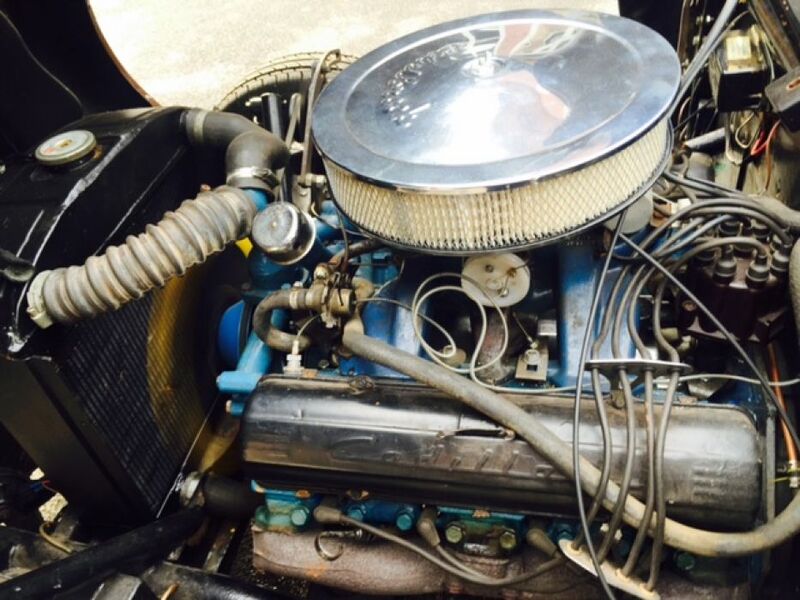 Tuned and tested, complete with a freshly re-cored radiator this year, the engine performs best with a newly sourced Holley 360 Carb. The interior has recently been completely re-trimmed in red hide which includes three rows of seats, the door cards, the 'A' pillars and all across the top of the dashboard, together with new carpets fitted throughout, piped red leather. The result is a surprisingly quick and agile large Allard shooting brake which recently left the owner's Range Rover Discovery for dust on a winding country A-road. With 3 rows of seats this very rare woodie shooting brake would make excellent and stylish transport for parties going to the races or travelling to a multitude of other events such as the Goodwood Revival - including attending Pebble Beach in California. 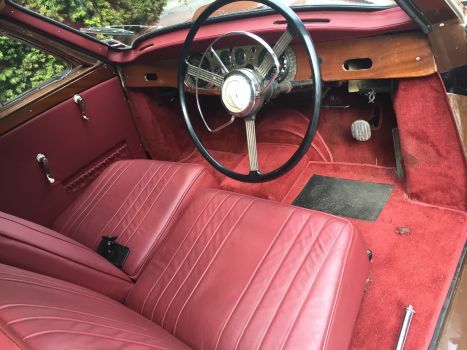 Taxed and ready for the road, considerable history comes with the car, owned for 29 years by a noted Allard competitor and friend of Sydney Allard. Having studied 3 of the surviving 4 examples, this Allard Safari is quite confidently the best Allard Safari in existence.